Leslie Green has been waiting a lifetime for the news he received last month. Fifty-seven years after Green fought in the Battle of the Bulge during World War II, the retired advertising executive found out the government really did think he was a hero. In August, the Army unit Green belonged to during the war - Combat Command A, Ninth Armored Division - was given the Presidential Unit Citation for extraordinary heroism. Green, along with seven of his fellow officers, received the award at a ceremony in San Antonio, Texas. According to Lt. Col. Stephen Nolan, chief of public affairs for the Fifth Army, Gen. George Patton recommended the combat unit for the citation back in 1944. The unit is credited with keeping the Germans at bay in Luxembourg for six days even though they were out numbered five to one. This defense allowed Patton to go forward with his plan to siege Bastogne during the Battle of Bulge. "I’m afraid I can’t take any credit for this," Green said. "This award came through after so many years because of one persistent fellow - George Ruhlen." Ret. Maj. Gen. George Ruhlen was commander of the third armored field battalion, to which Green belonged. For decades, Ruhlen inquired about the award he believed his men had earned. Lost paperwork at the Pentagon appears to be the culprit all these years, Nolan said. "If you ask me, I think everybody was in a hurry to get home and didn’t really give a damn," Ruhlen said. Green said it was a shock to everyone to find out the unit had received the citation after all these years. "I wish it had Truman’s signature on it, but George W. Bush is OK," Green said, grinning. The last month has stirred up many memories for Green, not only because of the citation, but also because of the recent terrorist attack. "To be honest, I haven’t talked a lot about the war," he said. "Once I came back, it wasn’t exactly the kind of thing you wanted to bring up at parties," he said. On a cloudy Monday afternoon from his Columbia home, Green still doesn’t reveal many details of his time in combat. "You know, my kids asked me to write a history of what I’ve been through, so they can pass it along to their children," he said. Despite a degenerative eye disease, Green hand wrote nearly 50 pages about his experience. 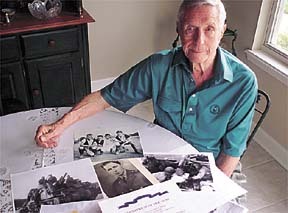 His book, titled "A Brief History 1935-1945," does reveal snapshots of a vibrant young man. After graduating from Hickman High School in 1936, Green attended the University of Missouri-Columbia and received an art degree. He was a handsome, popular student who belonged to Sigma Chi and excelled on MU’s polo team. "I had a convertible; I was young. It was the good life," he said. After graduating from MU in 1940, Green was hired to coach the polo team. Once the war started, though, people stopped coming to games. "It just wasn’t important anymore, and I decided to enlist," he said. Green said he hopes the recent terrorist attacks in New York and Washington, D.C. won’t mean more young people will have to go to war. "I 100 percent support our president, but I hate to see any of our soldiers have to go over there," he said. "I wouldn’t wish war on anyone."